I have to give all credit for this project to my brilliantly creative uncle who originally posted these pictures on Facebook. 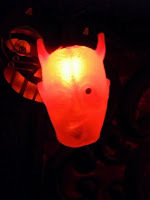 He had seen some vintage devil lights a few years back, but at the price of $200, he passed them up. After lamenting this decision through the years, he decided to put his creativity to the test and make some of his own. First, he got $3 Santa lights at his local Dollar Store. 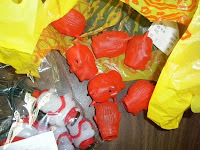 He had seen these plastic devil heads for cheap and knew just what to do with them. He made a template for the holes (based on the Santas) and cut holes into the Devil heads. Then he popped in the lights and voila! I think this is a very cool example of taking inexpensive every-day objects and transforming them into something totally wicked (sorry for the pun).